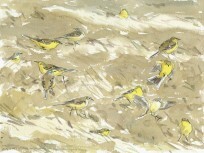 The paintings shown are original watercolours by James McCallum. Each painting is signed and as all are made from life many also bear the date of completion and, occasionally a few small handwritten notes such as location, weather, behaviour, etc. If further details are required please feel free to ask via the contact page.